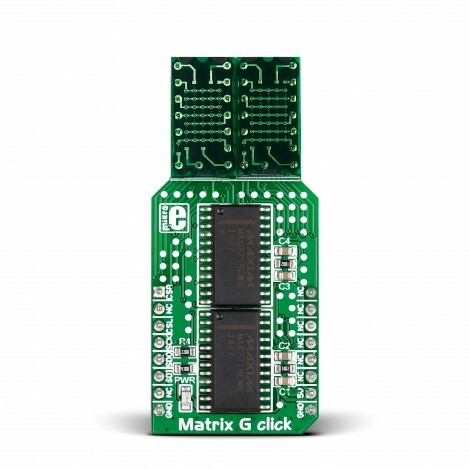 Matrix G click is a mikroBUS add-on board with two green 5x7 matrices driven by two MAX7219 8-bit LED Display Drivers. The active area of each matrix is 7.62mm high and 5.08 mm wide. 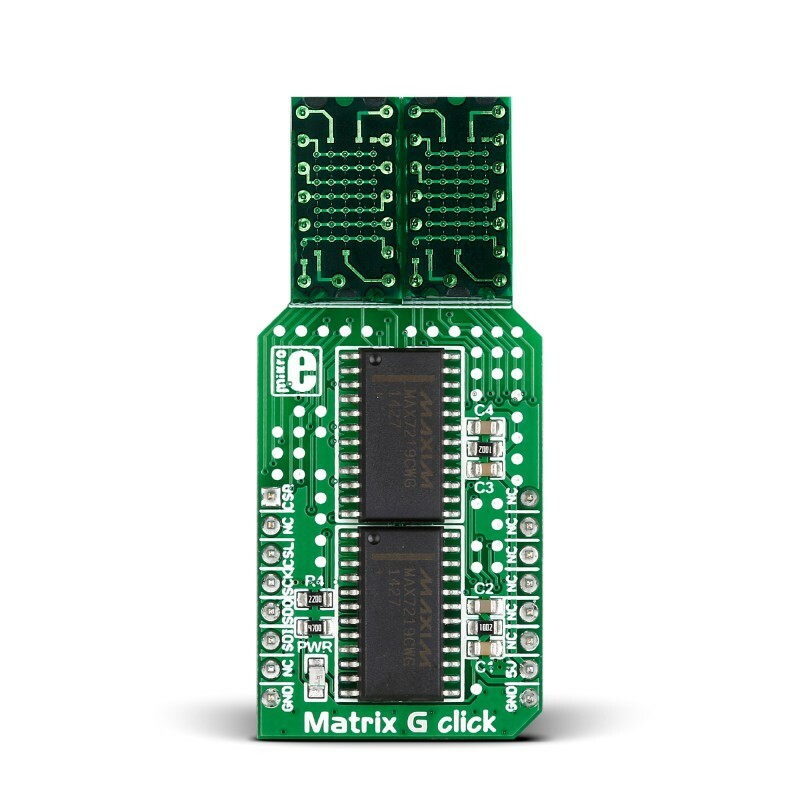 Matrix G click is a mikroBUS add-on board with two green 5x7 matrices driven by two MAX7219 8-bit LED Display Drivers. The active area of each matrix is 7.62mm high and 5.08 mm wide. 7x5 is a standard resolution for displaying ASCII characters, so the click is essentially a dual-character display capable of showing letters in more readable typefaces compared to a 14-segment display. The click communicates with the target MCU through the mikroBUS SPI interface with two separate Chip Select lines for each matrix (CSL for the left, CSR for the right). 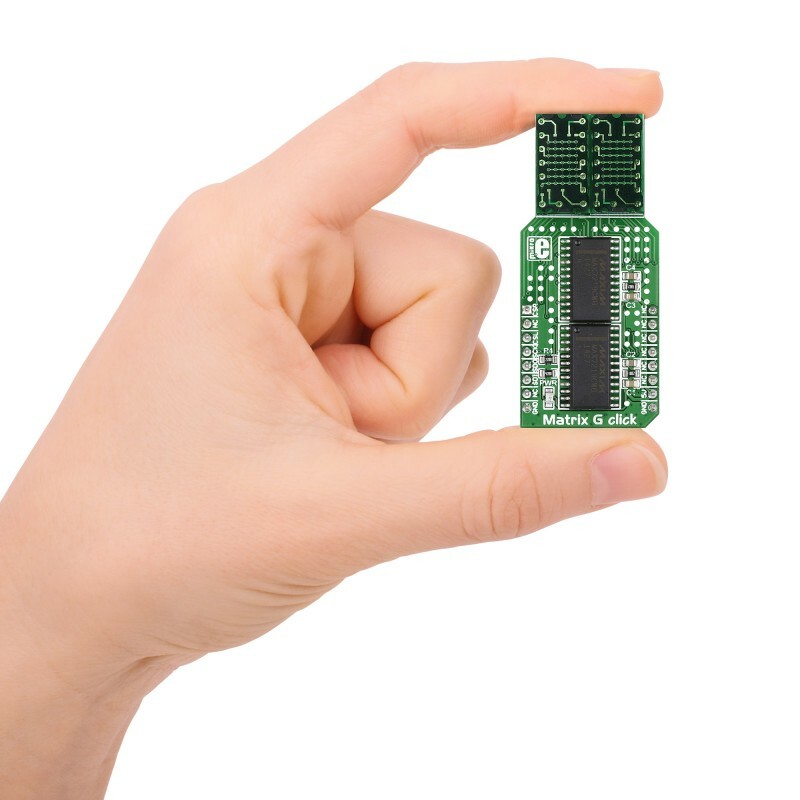 This board is designed to use a 5V power supply. The 7x5 LED matrix is a standard resolution for displaying ASCII characters. Matrix click is essentially a dual-character display capable of showing letters in more readable typefaces compared to a 14-segment display. 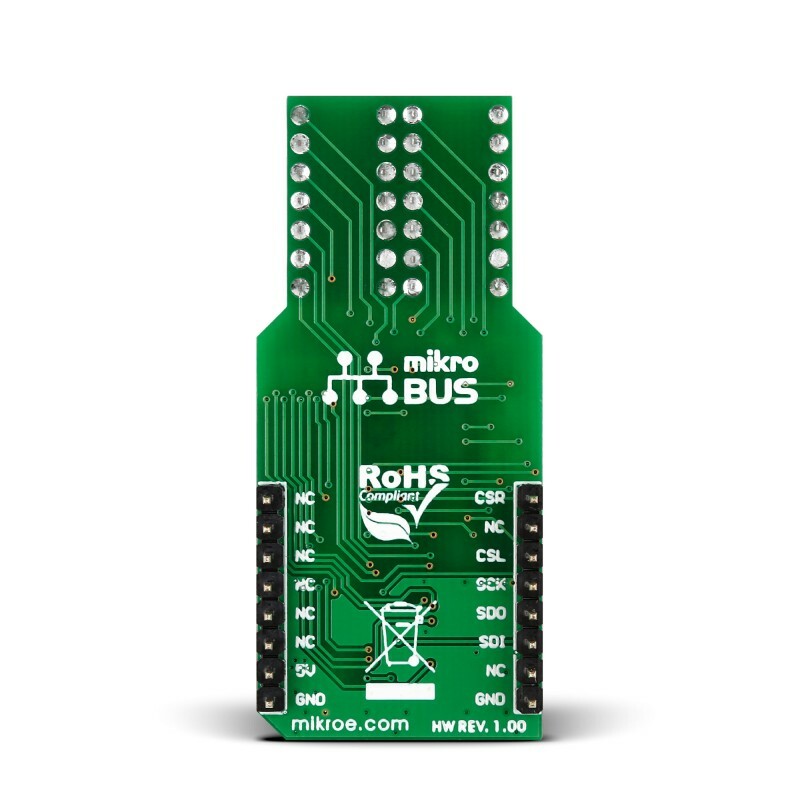 If you double up on a board with two adjacent mikroBUS sockets, such as clicker 2 or Flip & click, you will get four characters. The possibility to horizontally scroll the text makes for a virtually unlimited space for displaying written information. 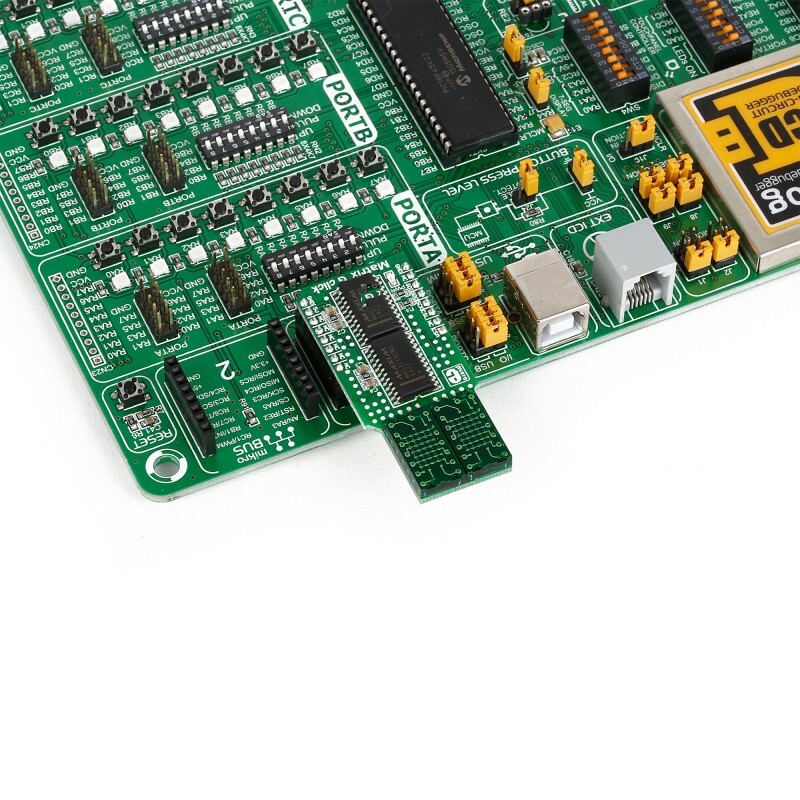 Code examples that demonstrate the usage of Matrix clicks with MikroElektronika hardware, written for mikroC for ARM, AVR, dsPIC, FT90x, PIC and PIC32 are available on Libstock.